Browse Artists and Groups Frank Hennessey, R.C.A., O.S.A. Frank Hennessey is one of the important and often underrated artists of the Ottawa region of his generation. He gained the distinction of becoming a full member of the Royal Canadian Academy of Arts. He displayed his work regularly in the RCA exhibitions, which took place at the Art Association of Montreal and the Art Gallery of Toronto (now the AGO). Hennessey was a member of the Ontario Society of Artists, Ottawa's Studio Club, the Ottawa Group and was also a Fellow of the Royal Society of Artists. His work was included among the elite group of Canadian artists who exhibited at the iconic 1924 British Empire Exhibition in Wembley and in the 1927 Exposition D'Art Canadien at Le Musée de Jeu de Paume in Paris. His piece that was displayed in Paris was lent and owned by the National Gallery of Canada. Clearly, he was celebrated during his lifetime as an artist of great ability and merit. Hennessey used to draw for the Government at Ottawa numerous precise illustrations to accompany the text written for pamphlets or anything of the kind needed for the dissemination of information. Doing that work, he developed into an expert draughtsman, but the remarkable further feature is the fact that in his real art work he sets aside the precise, constricted methods, which some observers suppose limit the results, and produces paintings, especially large pastel landscapes, that are notable for their broad, loose treatment, spontaneity, and sparkle. He usually works in the open, direct from nature, and frequently, while the light lasts during the middle of the day, completes in one essay a satisfactory large pastel that never afterwards is touched. Oftentimes Brownell and Hennessey take sketching trips together, following by motor-car the Gatineau River northward into the Laurentian hills to a place called Pickanock [...]"
Brownell leans towards uncultivated fields, with stumps and rocks showing through the turf, with animals-maybe cattle, maybe horses, maybe swine or sheep-cropping contentedly grass, while Hennessey seeks out the rushing stream or river. And should men be cutting or hauling ice in winter or twirling logs in summer, there is no complaint. For each artist is a law unto himself and in that law lies the seal of his salvation..."
"Eva Major-Marothy speculates that the Studio Club may have formed the core of the 'Ottawa Group,' which held an exhibition at Hart House in Toronto in January, 1924. This Group included Paul Alfred, Harold Beament, Frank Hennessey, Florence McGillivray, Graham Norwell, Yoshida Sekido, and David Milne in one of his few incarnations as an 'Ottawa' painter. This 'Group' was intended to be Ottawa's equivalent to Toronto's Group of Seven and Montreal's Beaver Hall Hill Group; it wanted 'to keep alive a healthy interest in art, modern Canadian art in particular.' Soon after the exhibition, Beament and Norwell left for Europe and Milne returned to New York, while the others carried on, individually or in conjunction with the activities of the Art Association.'' (History of Art and Artists of Ottawa and Surroundings, 1790-1970 : Part II, 1880-1945. The Ottawa Art Gallery. 1994. pg. 23). "Hennessey was a practical exponent of the pastel medium and used chalks with vigour and confidence. The country under snow was an alluring time of year for him, as were the spring thaw and the break-up on rivers. 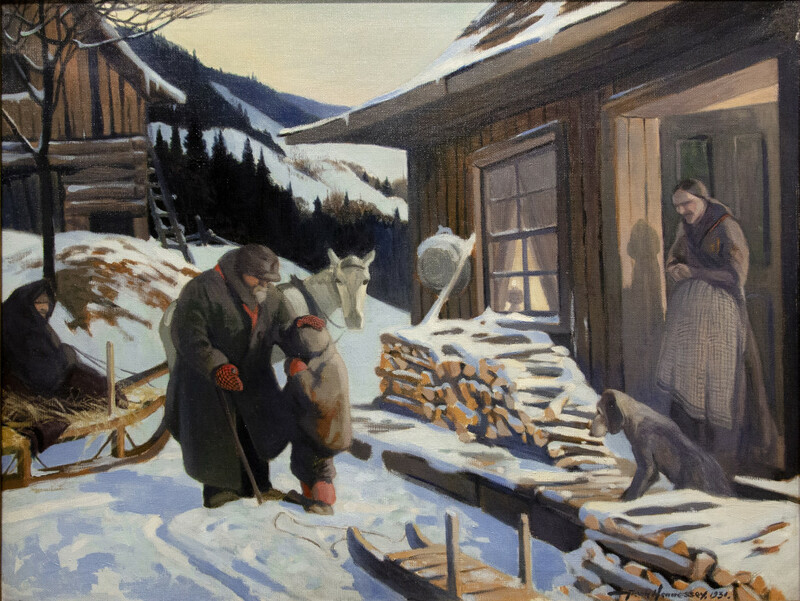 He enjoyed painting the subtle obscurities that came with sundown on winter days. 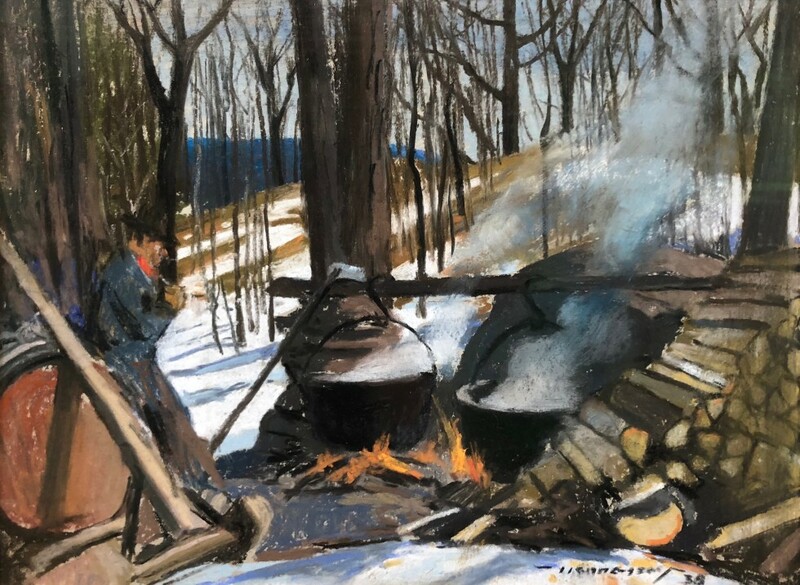 Hennessey, who excelled in oils as well, taught the young artist how to interpret the wilderness on canvas..." (C. Anthony Law: a Retrospective. Art Gallery of Nova Scotia. 12 May- 25 June 1989). Please send me more details about the following artist. Frank Hennessey, R.C.A., O.S.A. signed "Hennessey / 38" (recto, lower right). titled and inscribed, "$500" in black ink to the Royal Canadian Academy of Arts: Fifty-third Annual Exhibition, 1932 label (verso, top horizontal stretcher).